We have been very busy. See below and you’ll know why. Congratulations to our below customers for having their mobile apps on the Apple and Android App Stores. Blynk looks forward to mobilizing them. Hotel Holt, a small 4 star hotel on a central but quiet street in downtown Reykjavík. They have a sincere dedication to making a visit to Reykjavík an unforgettable one. With only 41 rooms, they are able to connect with their guests and give them the personal attention they would only dream of in a large chain hotel. With beautiful artwork all around and Iceland´s premier restaurant on the premises, their guests are sure to have an experience that will leave a special place in their heart for Hotel Holt. PATHUMWAN PRINCESS HOTEL is one of Bangkok’s leading 5-star hotels, situated in the heart of the city. The hotel’s location is unique, sitting adjacent to MBK Center and opposite Siam Square. Surrounded by Bangkok’s best retail and entertainment facilities, guests really are spoilt for choices. The Pathumwan Princess Hotel is not just another 5 star hotel. It is an award-winning luxury hotel with distinctive refurbishments in chic urban motif reflecting a high-variety of city living emotions. With a history spanning over three centuries of glorious tradition, this is the story of an Indian business house that, till date, embodies the unique ethos of its birthplace, Varanasi. Today, the Group is a leading player in textiles, manufacturing, international trade and hospitality, consisting of companies such as Banaras House, Indian Textiles, Great Value Travels, Great Value Hotels and the Clarks Group of Hotels. Lotus8 A’part Hotel, lies close to Kochi, the Queen of the Arabian Sea and the commercial hub of Kerala, the southernmost state of India. It is just at a stone’s throw from the main gate of the International Airport at Nedumbassery. The universal appeal of this apartment hotel makes it equally alluring to the business executive, the family tourist and the individual traveller. The true paid tariffs for actual duration of stay, reasonably fixed to fit the middle class traveller, with royal comforts and ultra modern amenities, will be a bargain deal for the tourist/traveller. The Golkonda Hotel Hyderabad is an exclusive Business Chic hotel located in the heart of Hyderabad at Banjara Hills, Masab Tank. It is about 30 minutes away from Hitec City. The Golkonda Hotel Hyderabad is an ideal hotel for both business and leisure traveler and is very close to the Hyderabad International Airport. Kanan Beach Resort – Kerala, the natural and homely Ayurvedic beach resort in God’s own Kerala at northern district Kasaragod, stays in between Kanhangad and Nileshwar. Kerala which is situated in the southern part of India is globally famous for its scenic beauty of greenery. Proud combination of elegance, tradition and comfort coupled with modern business facilities expected from an international standard hotel. Exceptional hospitality and guest comfort combined with fine beauty and tradition marks the beauty of Emarald which is why they are the best hotels in India. Nestled at a comfortable distance of less than an hour’s drive from Ahmedabad and Vadodara, Boulevard 9 luxury Resort & Spa presents a whole new world of comfort and understated luxury. Hotel Royal Orchid Suites is an unmatched five star hotel where you can feel a buzz of business along with comfort and tranquility. Friendly hotel in the heart of Bangalore, which is favorite among global travellers. Hotel Royal Orchid Suites is recognized for all round excellence and unmatched level of services to business and leisure travellers. Click on the below badges to see above apps of our customers. Congratulations to our below clients for having their mobile apps on the Apple and Android App Stores. Blynk looks forward to helping them connect with their guests. The Tropical Garden Lounge Hotel and Resorts is located in Samui Island, the splendid tropical islet treasure found in Southern Thailand. They offer world class indigenous Thai-style bungalow accommodation as one explores the magic that the pristine white sandy beaches, overhanging coconut trees and the clear blue waters of the sea, best suited for diving and snorkelling The Coconut Island, with its abundance of flourishing corals is a paradise best fit for snorkeling, swimming, and diving exploits. Bavoort restaurant is located in Leusden, Netherlands. It boasts of sunny spots and fantastic illuminated terraces. Their menu offers a variety of dishes and menus, which are adjusted monthly to what the season has to offer. They also provide barbecues, buffets , high teas and parties. Part of the famous Fortune Group of Hotels, FPL is located in Thane, near Mumbai, India. Thane is also popularly known as “city of lakes” as it is surrounded by 30 lakes and along with has been recognized for the best town planning and beautification. Thane, City of Lakes, bustling and self-sufficient, now houses Fortune Park Lakecity. Strategically located on the Eastern Express Highway, it is well connected to business and industrial nerve centres like Waghle/Kolshet, Bhiwandi, Airoli, Kalwa, Vikhroli, MIDC & SEEPZ, Navi Mumbai and Mumbai itself. Tastefully and thoughtfully appointed, Fortune Park Lakecity is the perfect amalgam of comfort, convenience and great value. Congratulations to our first round of customers for having their hotel apps on the Apple App Store and the Google Play Store. We are happy to announce that the upscale The Park Group of Hotels has chosen Blynk to power its mobile presence. Located in some of the biggest cities around India, The Park is a likely choice of destination for corporate and leisure travellers. In each city, the properties are at prime downtown locations giving the guests easy access to the commercial and entertainment hubs around town. Stylistic luxury enhances every detail at The Park ” from the art, the furniture and the ornamentation to the dining and entertainment facilities. The Park has achieved excellence in the market through the ceaseless up-gradation of products and services, making it a truly cutting-edge international experience. Guests checking in Khirasara Palace Hotel in Rajkot will now be able to explore the heritage property and order services and in-room dining from iPads via their iPad app, powered by Blynk iHotel. 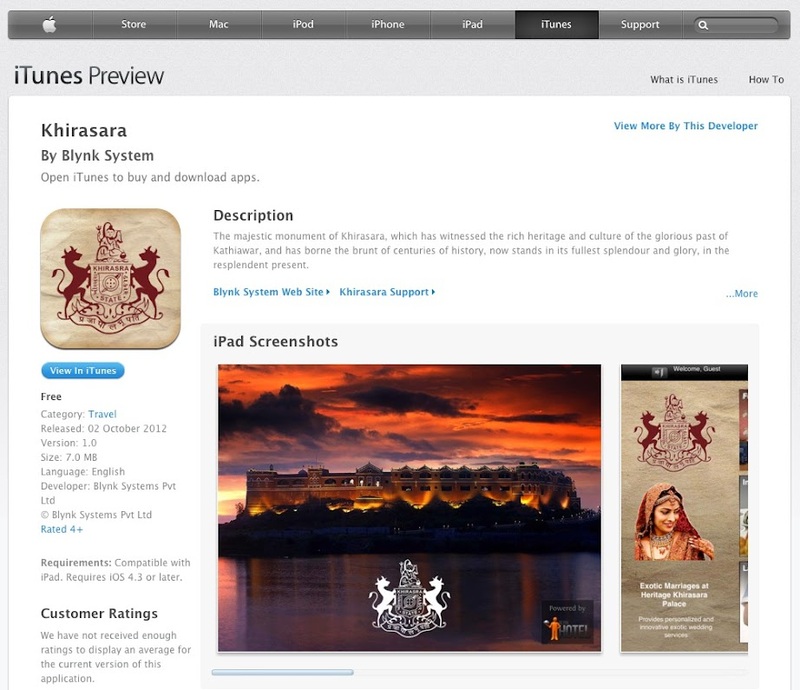 To explore their app, install it on your iPads by downloading it from the iTunes store.